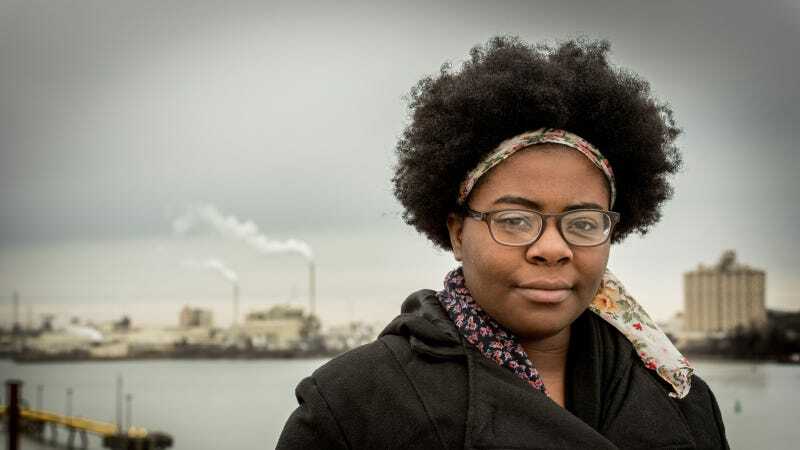 In 2012, Destiny Watford learned that a company called Energy Answers was going to build what they call a renewable energy power plant—and what she calls a trash incinerator—in her hometown. She knew she had to act. "A group of friends and I decided that there had to be something done about this," Watford, now 20, told me in a phone interview. And so they did something. Watford, who received a prestigious Goldman Environmental Prize for her grassroots activism on Monday, and a group of dedicated teen activists, went up against the corporation. Watford grew up in Curtis Bay, Baltimore, where residents are no strangers to pollution. "When I was younger, I could smell noxious odors," Watford told me. "I knew that the air in Curtis Bay wasn't the best, wasn't the cleanest, but it was something you lived with for so long that you didn't question [it]." Watford's mother and brothers suffered from asthma. For her and those in the neighborhood, dirty air was a given—the area is one of the most polluted in Baltimore, and has been for a long time. It wasn't until she learned about the plant that she started to think about the connection between her hometown's polluted environment and inequality. "The incinerator violated all of the human rights we believe we had the right to," she said. Destiny Watford, Curtis Bay Area, Baltimore, MD Destiny (right) with teachers and advisors from the Benjamin Franklin High School she attended. L to R: Kelly Oglesbee, Dante deTablan, Linda Luallen, and Destiny Watford. Trash incinerators are not inherently bad. Some environmental activists consider waste-to-energy plants a better option than other garbage disposal methods. A number of American cities employ waste-to-energy incinerators as a way of powering nearby buildings. Covanta Energy Corp., which operates a facility in Virginia, says that it takes a number of measures to make sure that the incinerator is safe, like monitoring emissions levels and using devices called baghouses to keep harmful toxins from polluting the environment surrounding the plant. Like others in favor of the trash-burning facilities, Energy Answers argued that their plant would offset negative environmental effects from landfilling, and increase recycling rates. Energy Answers said the incinerator would "generate energy from renewable and alternative fuels," create over 180 permanent "green collar jobs and opportunities for hundreds more," and "create an average of 400 union construction jobs over a 3 year period." But there are questions about the efficacy of these measures—some fear they're not enough to protect local residents from the carcinogenic emissions produced by incinerators. The plant Energy Answers planned to build is less than a mile away from the Benjamin Franklin High School, where Watford was a student when she learned about the agreement. Two other schools are in the one-mile radius as well. When Watford first caught wind of it, the plant wasn't a well-publicized project. "It's not like it was broadcast to the world," she said. "It was in a random article in a local newspaper." Watford and her friends started a public information campaign, and began to unravel the bureaucratic knot that led to the project's approval. To reach people, Watford said, her group Free Your Voice (a part of the human rights organization United Workers) ran an artistic campaign. "Members of the group are poets and musicians and artists," Watford told me, "so we used our creative abilities to tell our story in a way that would change hearts and minds." Destiny Watford, Curtis Bay Area, Baltimore, MD In nighborhood area she and her group often canvases to spread information about the proposed hazardous waste incinerator. Eventually, Free Your Voice helped convince the 22 groups that made up the Baltimore Regional Cooperative Purchasing Committee to back out of their contract with Energy Answers. United Workers celebrated the decision in a statement last year, noting that "public scrutiny of the purchasing contract grew when students, parents, and teachers from Free Your Voice…called on the Baltimore City School Board to opt out of this agreement last spring. Free Your Voice mounted a public pressure campaign across the region." The Free Your Voice campaign ultimately defeated Energy Answers' effort on something of a technicality. In a 2014 letter to company president Patrick Mahoney, Assistant Attorney General Roberta James wrote that "the [Maryland Department of the Environment] has determined that Energy Answers Baltimore, LLC… has violated Maryland's air quality regulations." James wrote that Energy Answers was both in violation of the terms of its permit, and that the company failed to purchase the number of emission reduction credits necessary before attempting to start construction. Under conditions set by the Maryland Public Service Commission, Energy Answers was required to buy credits representing more than 1,500 tons of emissions of pollutants, including nitrogen oxides, volatile organic compounds and particulate matter, if it was to begin and continue construction of the facility… Energy Answers provided proof to state environmental regulators that it had obtained enough emissions offsets for construction of one of the four units on Aug. 5, 2013, a day before it was required to begin construction under an order from the Public Service Commission, according to the letter. It began construction the next day, the letter said. According to the letter, Sasol North America Inc., a Houston-based manufacturer of detergents and chemicals, notified the state June 2 that Energy Answers failed to buy about 80 tons of emissions offsets that it had said it would buy from Sasol. Sasol spokesman Russell Johnson said the company had been renewing its option to buy the credits on a quarterly basis, but that it did not renew the option during the most recent quarter. The violation left Energy Answers open to millions of dollars in fines. But Energy Answers had the option of settling, and the Maryland government didn't definitively stop the project. So Free Your Voice took things into their own hands. Frustrated by the lack of action from the MDE, Free Your Voice organized a protest to demand answers from the department. In December of 2015, around 100 protesters marched and chanted outside of the MDE headquarters. Seven people were arrested (the charges have since been dropped). A few months later, in March of this year, MDE Secretary Ben Grumbles said he'd reached a decision. "After a thorough investigation," Grumbles wrote in a letter to Mahoney, "the Department has determined that more than 18 months have elapsed since the last construction activity was performed at the Energy Answers' Fairfield facility…. consequently, by operation of law, the air quality provisions of the Energy Answers CPN have expired and are no longer valid." Energy Answers did not agree to comment on this decision. According to The Washington Post, Grumbles spoke about Watford directly in a statement he gave recently. "Destiny is a talented, resourceful and passionate young advocate,” he said, adding "with great potential to make a difference in the lives of those around her.” If Energy Answers wants to start operations again, it will need approval from Curtis Bay groups—something it's unlikely to get at this point. Watford said that the core Free Your Voice group, her friends from high school who helped start the campaign to stop the construction of the trash incinerator, are still involved. "We all contribute in different ways," she said. Watford and another Franklin alum are now students at Towson, and serve as mentors for the group. Watford has some ideas about how the proposed incinerator site could be better utilized. But the most important thing, she said, is to make sure that her community is empowered. "Community ownership of land is the next step," she told me, adding, "we get to decide what actions we as a community will take together."